Goia armchair is the new Beltá proposal for those seeking comfort and originality. The idea of a product with a high component of craftsmanship coupled with forms that are wrapped to create an object whose beauty does not belong to any style or era. 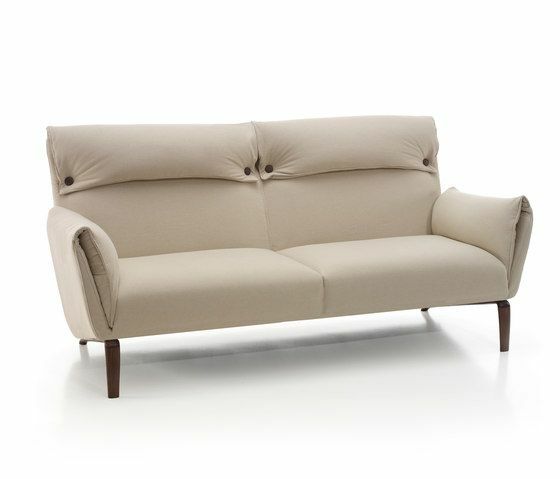 The curved line and the organic form in the interior are opposite to the accuracy and straightness of the exterior; the exquisite detail of the fold is stressed with the buttons. A model that serves both for avant-garde spaces and more classic; unique and versatile. MATERIALS: – Tubular steel frame covered with HR 35 kg/m3 foam with thermo sealed H250gr fiber. Suspension made with Nea elastic webbing with 10 year guarantee. – Backrest and seat made with combined HR 35kg/m3 and covered with 250gr fiber – Headrest pillow and arms made with down touch microfiber (Microgel) with inner cover to avoid deformation. – Leg p-64 p-66 stainless steel, p-65 p-67 wood.